When the Strait of Juan de Fuca is too rough for a comfortable crossing, or when conditions are marginal and the forecast is not favorable, boaters cruising to the San Juans from central Puget Sound will often “run up the inside route” east of Whidbey Island. The lee side of Whidbey can remain very passable even when few reasonable boaters would voluntarily venture into the Strait of Juan de Fuca. There are two exits from the “inside”, but they share a common route up as far as the end of Skagit Bay. There is very little commercial traffic on the east side of Whidbey Island. It isn’t unheard of to encounter tugs and barges, and sometimes a naval vessel is en route to or departing from Everett. Watch out for the ferries between Mukilteo and Clinton and the Victoria Clipper can be encountered in these waters as well. Once beyond the Clinton ferry dock, a course near mid-channel in Saratoga Passage will keep a northbound boat well removed from any hazards. 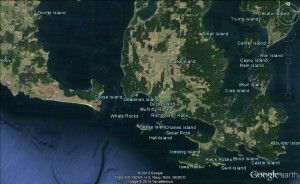 The northwest corner of Saratoga Passage is ready to challenge boaters with some shoals off Snatelum Point, (near Coupeville) and a virtual rock garden north and east of the Oak Harbor entrance buoy, but the inside route to the San Juans clears Saratoga Passage to the northeast, around the tip of Camano Island, so the northwest hazards are of no consequence unless a boater is diverting into Coupeville or Oak Harbor. 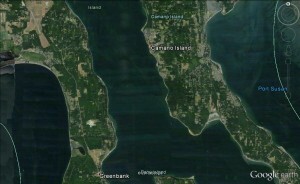 Beyond the northern tip of Camano, in Skagit Bay, what appear to be miles of open water is actually an extended mudflat. The only safe passage for vessels with any draft at all is along the western reaches of the bay, not far offshore from the northern portions of Whidbey Island. The route is well marked on charts, but be sure to stay on the proper side of the buoys.